How can you make your backyard space more inviting? 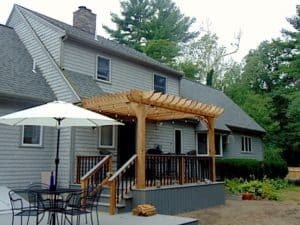 One surefire way is to create an outdoor gathering space using one of today’s top design features: pergola kits, outdoor fireplaces, and bar/dining areas. Incorporate a patio cover and soon your backyard will be your favorite place to entertain. 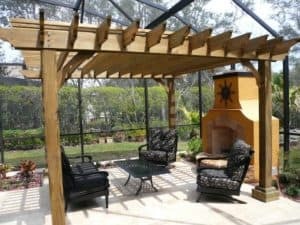 Using outdoor pergola kits as the centerpiece is a great place to start, and build around the frame that a pergola can provide. You may already have an outdoor design but are trying to figure out how to add to it to really make it an outdoor room rather than just a placeholder for patio furniture. 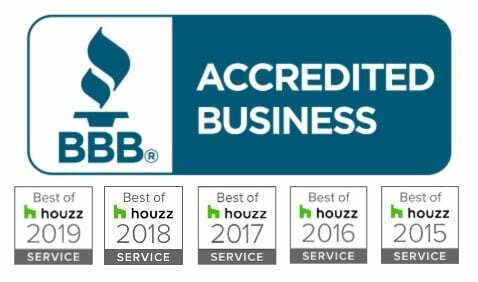 Consider these outdoor living concepts, and you’ll be well on your way to a new outdoor retreat as well as finding out how the world of outdoor pergola kits truly ignites today’s backyard retreat designs! Already established landscaping is greatly enhanced with garden trellis pergolas or full-size patio cover pergolas that can extend your patio beyond the boundaries of the dining table. Make your space really feel welcoming and comfortable using outdoor pergola kits that attach to your home. This approach is a quick way to extend the space you find yourself dreaming of when you’re looking to relax and kick your feet up for a weekend dinner. Attached pergola kits not only offer an extension of your home, but also add a unique modern look to the design of your patio. You can blend the style with your home by choosing a either a classic or modern pergola style and specific end cuts that match your home or outdoor landscaping. Freestanding outdoor pergola kits are another way to enhance an existing deck or patio space. Stand-alone pergolas come in various sizes whether you’re working with a quaint fenced in yard behind your townhome, or a large backyard that’s spacious enough for an entirely separate outdoor living room. 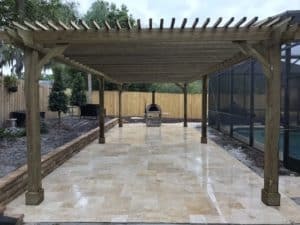 This 17×19 Big Kahuna pergola provides a way to connect two areas of your backyard. Create a small walkway that extends from your screened or covered porch and make it a destination away from the business of the main house. There are many ways to configure your outdoor area, so take your time researching which concept to incorporate that’s best for your outdoor lifestyle. 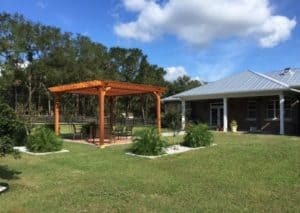 Everyone has their own opinion about patio covers and pergolas that would work for their unique space. Some of the best pergola kits used in outdoor living designs are attached wooden pergola kits and freestanding wooden pergola kits. Wood pergolas provide a natural addition to your outdoor area that helps maintain the beauty of your surroundings. If you’re trying to partially enclose your back porch and provide additional coverage, an attached pergola is an easy way to extend the use of that space. Or, you may be trying to accommodate a full set of furniture to enjoy in your backyard or a grill-station for your outdoor BBQ. Whatever your vision is, choosing the correct size patio cover can finish off the space perfectly. Larger pergolas bring even more structure and create a large covered area near a space that lends itself to large gatherings, like this poolside patio area. An otherwise underutilized space on very hot days, this side patio next to the screened in pool area could accommodate a nice picnic area, outdoor ping-pong table, or comfy couches and side tables. Add some seasonal potted plants intermingled between your furniture, and you’ll have gorgeous blooms to decorate your poolside retreat! Covering your patio can be accomplished with screened porches, awnings, pavilions, and pergola kits. Sometimes incorporating both into your outdoor play area can make a poolside porch even more inviting. 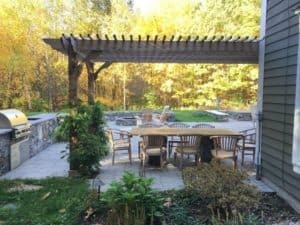 The growing popularity of pergolas you can build from a kit has sparked a wave of enthusiasm for outdoor entertaining. Why not add a pine or cedar pergola to a fireside seating area to renew your screened porch? Make this the year you pledge to enjoy the outdoors more right in your own backyard. It’s one of the easiest ways to optimize your investment, spend time with your loved ones, or relax with a good book. Even your pets will thank you when you take the plunge and expand your outdoor area with a patio cover pergola kit and build a new shady space! Enjoy the outdoors more under your own backyard pergola. Get started today to make your dream a reality.